The United States Customs and Border Protection (CBP) is a federal agency within the Department of Homeland Security. Within CBP there are several commissioners’ offices, including the Office of Border Patrol (OBP), which is responsible for enforcing the country’s immigration laws. OBP has an annual operating budget of $1.4 billion and it employs more than 21,000 agents to patrol the nation’s 6,000 miles of borders. The Rio Grande Valley Sector of the OBP alone includes 2,546 border patrol agents. This sector, one of nine OBP sectors positioned on the southwest boundary of the United States, spans 17,000 square miles of Southeast Texas. Six stations within the Rio Grande Valley Sector are located on this border. Three additional stations are responsible for patrolling traffic checkpoints and marine operations in the Gulf of Mexico. Under the Illegal Immigration Reform and Immigrant Responsibility Act of 1996, any immigrant expressing a fear of return to their home country must be granted an interview with an asylum officer. In order to ensure that the right to this interview is known to detainees, officers should ask directed questions that might bring out information that would demonstrate evidence of an intent by the detainee to seek asylum. This questioning should be completed before the immigrant signs an order for expedited removal. Hundreds of thousands of immigration detainees are placed in CBP holding cells each year. In early 2013, Americans for Immigrant Justice (AI Justice) attorneys began hearing jarring narratives from detainees who had been transferred from CBP custody in the South Texas Rio Grande Valley to the Broward Transitional Center (BTC) in Pompano Beach, Florida. Immigration and Customs Enforcement (ICE) contracts with BTC, which is run by the GEO groups (formerly Wackenhut). While detention in CBP holding cells is supposed to be temporary, persons we met with had been detained there for as long as 13 days. The temperature in the cells is so cold that CBP officers themselves refer to them as “hieleras,” or iceboxes, in Spanish. Detainees’ fingers and toes turn blue and their lips chap and split due to the cold. Blankets are not provided. These crowded hieleras have no mattresses, beds or chairs, and there is a single sink and toilet in plain view. Detainees have no choice but to urinate and defecate in front of their cellmates. Detainees are not given even the most basic supplies, like toothbrushes, soap, combs or ample sanitary napkins, and are unable to bathe, take showers or change clothing. The only water available is in a single thermos, filled with bleach-like water, burning the throats of those who drink it. Detainees are only fed a single, oftentimes frozen, sandwich twice a day. Sleeping on the cold floor is even more difficult because bright overhead lights are left on 24/7. CBP officers’ treatment of detainees exacerbates the situation. Detainees routinely report officers threaten that if they don’t sign deportation orders, they will be sent somewhere even worse than the hielera. Generally detainees don’t understand the papers they’re signing since most don’t speak or read English, and no translation is provided. Many persons detained in the hieleras are asylum seekers who fled life-threatening sexual abuse and domestic violence. Below are the stories of 8 AI Justice clients, hielera survivors who fled to the United States seeking freedom and due process but instead were further traumatized by dehumanizing conditions while detained. Sofia is a mother in her early thirties. In the process of being taken into custody, a CBP Officer knocked her into the ground face first. He ordered her and others to “subete a la perrera,” which means “get in the dog kennel” in English. While freezing in her wet clothes, she could see a pregnant woman in the adjoining hielera and a two year old child. While detained, she was threatened with worse treatment elsewhere if she didn’t sign a deportation order written in English, which she could not understand. She was never once asked whether she had a fear or concern of being returned to her home country, which she clearly did. Alberto is in his early twenties. When the CBP officer apprehended him, he was taken to a hielera held more than thirty people. It was so cramped that it was impossible for everyone to lie down on the icy-cold floor for warmth and to try to sleep. CBP officers could see detainees using the toilets and there was never enough toilet paper. Alberto was threatened with a federal prison sentence if he didn’t sign his deportation order. A CBP officer laughed and mocked Alberto when he began crying because he was afraid to return to his country. Lucia, in her late twenties, was taken into custody with her family. While in the hielera, she witnessed detainees sleeping near the door or toilet to avoid the blasting, cold air vents. Lucia was so humiliated to go to the bathroom in the exposed toilet that she contracted a urinary tract infection from forcing herself not to urinate. For six days she wore the same clothes without being able to take a shower. Lucia was told she would be let out of the hielera if she simply signed a paper. Unbeknownst to her, the paper, written in English and not translated, was an order for her expedited removal. Emilia is a mother in her early thirties. While in the hielera, she repeatedly pleaded with CBP officers to turn off the air conditioning. Her pleas were ignored. Emilia witnessed a lack of medical care provided detainees. For example, one detainee had to wait more than a half hour for medical attention after having a seizure and another received no medical care to remove a painful thorn. While in the hielera, Emilia was menstruating but unable to shower. Her underwear became soiled and smelled bad and Emilia tried to stay as far away from other detainees as possible because she was so ashamed. Emilia was erroneously led to believe that she had no choice and had to sign an order for expedited removal. Clara is a 21 year old woman who was taken into custody with her teenage sister but then separated from her in the hieleras. Ill at the time she was apprehended, CBP officers took away Clara’s cough medicine despite her persistent coughing and severe headaches. She pleaded with CBP to get her medical attention, but was told that they’d only take her to the hospital if she was dying. When she was eventually transported to the hospital, the doctor prescribed medication for her infection. She never received after being returned to the hielera that same day. The next day, Clara noticed her sister being escorted somewhere by CBP officers who would not tell Clara where they were taking her. Clara felt pressured into signing an order for expedited removal, which she could not comprehend since it was written in English and was not translated. Juliana is in her late twenties. When she first saw CBP officers she approached them and pleaded for help. She had not eaten for two days and was soaking wet from the pouring rain. Diabetic, her prescribed medications were taken from her upon detention in the hielera. Although Juliana was menstruating while detained, CBP officers only provided 5 sanitary napkins in the morning for the more than twenty women in the cell. Because of her diabetes she was weak and unable to get close to the cell door to grab one. On her second day in the hieleras, she was severely dehydrated, had the shakes and threw up. She fainted and fell onto a pile of soiled toilet paper. When she regained consciousness she was in a hospital. She overheard the doctor saying to CBP officers in Spanish that she needed insulin, yet when she returned to the hielera none was provided. CBP officers told Juliana that she could be charged with federal crimes and sent to prison if she didn’t sign the expedited removal document, written in English, which she couldn’t understand. Isabela is a mother in her mid-thirties. She too is diabetic and had her medication taken from her upon detention in the hielera. While there, she noticed that CBP officers would often disturb detainees by walking through and nudging them with their booted feet while the detainees were trying to sleep. Isabela was placed in a hielera with at least two pregnant women. Menstruating while detained, Isabela pleaded for more sanitary napkins but was not given any. Her clothes became soiled and smelled and she felt ashamed. The toilet area in the hielera was filthy. There was a large pile of sanitary napkins and toilet paper with human waste on it next to the toilet. The CBP officer told Isabela that if she did not sign the deportation order, which she could not understand, that he would sign it for her. She refused and told the officers she was terrified of being returned to her home country because of the severe domestic violence she had suffered there. Eventually, she unknowingly signed an order for expedited removal. After interviewing more than fifty hielera survivors, including children as young as six years of age, AI Justice believes that immigrants detained in the Texas Rio Grande Valley Sector are being gravely abused during detention in United States Customs and Border Protection hieleras. AI Justice has started a campaign to expose this systematic abuse by partnering with organizations like the Robert F. Kennedy Center, RAICES (Refugee and Immigrant Center for Education and Legal Services) in Texas, celebrities, and other national immigrant advocacy groups. AI Justice’s impact litigation team has filed Federal Tort Claims Act (FTCA) administrative actions on behalf of the eight hielera survivors described above. We also drafted legislation that requires compliance in CBP hieleras with ICE regulations, including proper credible and reasonable fear questioning of detainees who express a fear of return, adequate nutrition, and humane conditions. This legislation was introduced by Senator Boxer (D-CA) as part of the Comprehensive Immigration Reform legislation (S. 744) but didn’t make it into the final bill. Senator Boxer intends to work with her colleagues in the House of Representatives to have the same language introduced in the House. To date, CBP has not even acknowledged receipt of our FTCA actions. The law requires that we wait six months after filing these complaints before going to federal court. AI Justice will file suit in Federal court later this year. *The images in this report came from several sources including http://photoblog.nbcnews.com/_news/2013/05/03/17763809-border-patrol-faces-new-challenge-with-surge-in-rural-texas-border-crossings?lite, http://www.washingtonguardian.com/budget-cuts-border-security-immigrant-detention, and http://www.dhs.gov. United States Customs and Border Protection, Office of Border Patrol (2012), http://www.cbp.gov/xp/cgov/about/organization/assist_comm_off/. Eric Lipton and Julia Preston, As U.S Plugs Border in Arizona, Crossings Shift to South Texas, N.Y. Times, June 16, 2013, available at http://www.nytimes.com/2013/06/17/us/as-us-plugs-border-in-arizona-crossings-shift-to-south-texas.html?pagewanted=all&r_0. United States Border Patrol Policy, Detention Standards: Reference No. 08-11267 (2008). Bo Cooper, Procedures for Expedited Removal and Asylum Seeking under the Illegal Immigrant Reform and Immigrant Responsibility Act of 1996, 29 Conn. L. Rev. 1501, 1516 (1997). Immigration Detention, American Civil Liberties Union, http://www.aclu.org/immigrants-rights/immigration-detention (last visited July 3, 2013). A Culture of Cruelty, No More Deaths, http://www.nomoredeathsvolunteers.org/Print%20Resources/Abuse%20Doc%20Reports/Culture%20of%20Cruelty/CultureofCrueltyFinal.pdf (last visited July 3, 2013). Removal Statistics, United States Immigration and Customs Enforcement, http:///www.ice.gov/removal-statistics/ (last visited July 3, 2013). 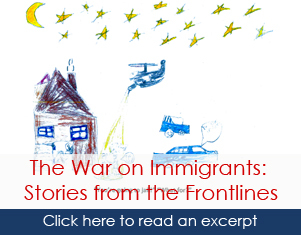 News Release, Americans for Immigrant Justice (AI Justice), Border Patrol Continues to Abuse Immigrant Women (May 29, 2013) (on file with AI Justice). Press Release, Refugee and Immigrant Center for Education and Legal Services (RAICES), Statement on the Conditions in the “Hieleras” and other Immigrant Detention Practices (June 12, 2013) (on file with RAICES). News Release, Americans for Immigrant Justice (AI Justice), Border Patrol Continues to Abuse Immigrant Women (May 29, 2013)(on file with AI Justice). The facts surrounding the incidents below are drawn from documents, evidence, and declarations incorporated into the Federal Tort Claims Act (FTCA) complaints involving clients currently being represented by Americans for Immigrant Justice (AI Justice). AI Justice is a non-profit immigration law firm dedicated to protecting the basic human rights of immigrants. For more information, go to http://aijustice.org/. *All names have been changed to protect identity.